For The Love of Dry Aged Steak! I love it when people get serious with food and goes all out to make sure that the food they serve is fondly remembered after its dining experience! Its restaurants like The Beato Steakhouse that takes the F&B business and our dining experiences to a new level. Beato, the Italian word for happy, is what owners Mr. Danny Choi and Mr. JK hope to have diners experience when they dine at The Beato Steakhouse. Both hailing from Korea, the owners first discovered their passion for a good piece of steak while studying in Boston, US in their early college years. They decided to open up The Beato Steakhouse in Malaysia as they loved the demographics here in the city. The Beato Steakhouse has two locations in the prime area of Solaris Dutamas and Bangsar. I visited the outlet in Solaris Dutamas one evening with a few foodies in tow. The ambience is inviting the moment one steps in. The restaurant has a soft warm glow throughout the ambience. Decorated in an urban industrial décor with raw bricks, cement, wood works and black steel, it’s modern and comfortable at sight. There are regular dining seats or booths for more privacy. There are lots of things to see at the restaurant. At the back of the restaurant, one can barely catch a glimpse of a glass covered kitchen as it stood behind a large panel of shelving storage together with a chiller that keeps the pieces of aged steak cuts plus a wine chiller. Owner Mr. Danny was present to show us his pride and joy, a custom chiller made with built-in-control humidifier that is the perfect room to age all his beef. 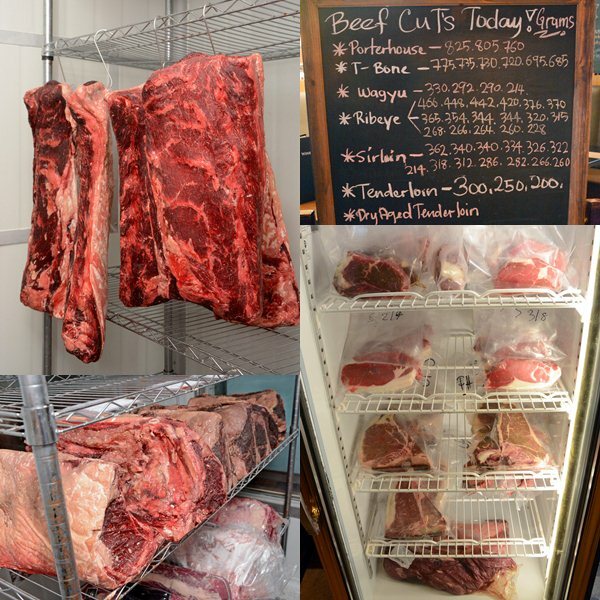 All beef cuts are aged at least 25 days and above before they are trim, cut and vacuum packed for orders. Aged beef are highly prized for their full flavours and tender meat. The aging process forms a dry crust outside the cut of the meat and the juices are sealed inside to intensify the flavours and also tenderize the meat. Once the aged beef is ready, it is trimmed off from the crust. Aged beef is pricier than regular meat because the aging process also shrinks the meat quite a bit and the outside crust has to be discarded. Each day, diners can select from the various choices of cuts and weight for their meal as it is all written down on a chalkboard for viewing. Every steak dinner at The Beato starts with complimentary Warm Bread with Butter & Olive Tapenade from the restaurant. The crusty rolls are delicious with a crusty outside, soft and fluffy inside. When served with the salted butter and olive tapenade, I could literally just keep enjoying these buns! If you are not a beef eater, fear not as The Beato has other dishes like their Half a Roast Chicken (RM39). The chicken is nicely seasoned with hints of garlicky marinade and roasted beautifully. It remained tender and juicy. It is served with some grilled vegetable on the side. Lamb Rack (RM59) is another dish also worth ordering at The Beato. One gets a good size of French trimmed lamb rack crusted with a golden nut and mustard breadcrumb crust. It is then nicely roast till medium pink. Served with classic mint sauce and some grilled vegetables, the lamb is scrumptious and well flavoured. JK, which is the chef for the restaurant, has really mastered the art of grill and roast to perfection as all the meat and seafood we had was cooked so well. Besides meat, there is also a few seafood dishes like this special of the day Baked Salmon with Smoked Salmon Salad. The thick slice of salmon is nicely broiled with a charred outside but has soft and pink flesh inside. It is served on a bed of greens with sliced onion, grilled zucchini, confit garlic, caper and drizzled with balsamic vinegar dressing. It’s got all the right balance of nutrients and protein needed for a good single meal and won’t leave you heavy after enjoying this dish. Moving on to the star of The Beato are the aged steaks! Ribeye Grain Fed (RM39 per 100g) was the first to arrive. The 228g of Ribeye is chargrilled to medium rare and is served with slow roasted garlic and a slice of lemon. It is how it should be, letting diners enjoy the purest way to savor a piece of quality aged beef. Our Porterhouse (RM38 per 100g) was a whopping one weighing over 800g. It was thickly cut which is how it is served in the States too. It is served again with the confit garlic, lemon slice and with the addition of mustard, grain mustard and horseradish on the side. This mega meat cut has always been a favorite of mine with a side of Striploin and Tenderloin. The bone-on steak can only mean better and extra flavours. Once again, the meat is succulent and bursting with a rich beefy note. While the tenderloin is tender, the striploin has richer flavours with a good bite on the texture. I find myself enjoying the porterhouse with the grated horseradish as it enhanced the flavours of the aged steak to another dimension of flavours. After savoring aged beef, I know it’s going to be difficult to go back to regular steaks. Just like the serious steakhouses in the States, side dishes are ordered separately. The Beato has a nice list of grilled vegetables and side dishes. We had the Grilled Zucchini (RM9) and Grilled Asparagus (RM14) from the Grilled section and these were lightly seasoned and not over grilled. I like how these are very delicate in flavours so it lets the aged steak shine better in their own jus. Mashed Potato (RM14) and Sauté Mushroom (RM15) are also side orders and these were pretty good. The Mashed Potato is whipped till the starch is released so it makes the mashed extra creamy and gooey while the Sauteed Mushrooms is nicely seasoned and earthy in flavours. Make sure to order their Sweet Potato Fries (RM14). These are simply a gorgeous treat. Sweet with a nice crunch, the sweet potato fries was literally the best side dish with all the mains. I got quite addicted to this side dish happily! I was quite happy that The Beato also has a nice list of dessert for a sweet ending. We had the Lemon Curd with Dried Mixed Fruit (RM19) which was a pretty platter of dehydrated fruit served with a luscious tangy lemon curd and some cream. Each fruit has its own intense flavours making the dessert different in every bite. The Beato Steakhouse strives to serve quality aged steaks! Everything they do, one can see it’s for the passion of letting their diners experience what a great steak is all about. At Beato, one can choose your steak by cuts and weights so it’s another nice touch for diners. These are really premium quality steaks so one does need to pay more but it is well-worth it once you tasted the steaks!